Demand for single malt whisky has put intense pressure on distillers to get the highest yield possible from their barley. As we all know, it only takes 3 ingredients to produce a single malt whisky, barley is one but there is more to it than that. Barley does not play a role in the flavour of single malt whisky. Is this true? So why are scientists developing new varietals of barley? Disease resistance, high yields and a grain that malts successfully in the macro-malt system. Distilleries say there is no difference in malt flavour, asking for barley focused on high yields. Aha! Distilleries such as Bruichladdich and Glenmorangie have experimented in terroir trials, heirloom barley varietals and roasted malts, all this is above my wee head and takes some understanding – varieties of barley, new strains … Dolly the sheep has something to do with this maybe? For instance Obsidian is a black barley varietal, barley can also be red, blue or purple as well? I am reliably informed Obsidian malts in nine days instead of seven. It yields less than the industry standard and it tastes different. We all know the ingredients can contribute to flavour in whisky, aye? But chat to a still man, or a cooper, or a warehouse man, they will ALL tell you, it is them who hold the key to a good dram. The barley used in the whisky making process (we are told) dictates the quality of the end product. Some distillers use only Scottish barley, others import from England or Europe and Canada. Distillers are looking out for a perfect barley, low in nitrogen, high in starch, good enzyme potential, good ability to germinate and create large grains. Thanks Vic. There are 5,500 or so different strains of barley, around 10 varieties, are approved for distilling, in Scotland – Belgravia, Concerto, Propino, Quench and Shuffle, with varieties including Moonshine, Odyssey, Chronicle and Overture. Varieties such as Oxbridge, Prisma and Chariot, Triumph are no longer used as they do not give a high enough yield. Golden Promise is hanging on by a thread for a couple of users. The varieties used change really quickly, so the 2 used most in Scotland now are Concerto (soon to die out) and Laureate. I chatted to another friend, in India; Michael John D’souza, Master Distiller/Blender at John Distilleries Pvt Ltd, Goa. Michael, many thanks for the “blether”. We have known each other a good few years now and time for an online chat. (see https://whiskytours.scot/interview-michael-john-dsouza ) You started in John Distilleries in 1993, in 2007 you were appointed to set up single malt distillation plant, you are now Master Distiller. In recent years we have been focusing more on improving the production efficiency and quality of our whisky. Question from Paul; The Barley you use is 6 row barley from the foothills of the Himalayas. Why this strain? Are there any plans to change or experiment? MICHAEL In India, we grow both 6 row and 2 Row barley. However the quality of the 6 row is higher when compared to the 2 row, hence we prefer the 6 row, moreover most of the farmers in India grow 6 row. At present we do not have any plans to change or experiment. Full interview http://whiskytours.scot/michael-john-dsouza. Those who malt barley, are known as maltsters, here in Scotland they look for grains arranged in two rows rather than six, as this allows for more consistency. Two row grains are also more likely to have more starch than protein, which is necessary for fermentation to take place. Most modern barley has a starch content of around 60-65%. Approx (careful here Paul) 80% of a whisky’s flavour from the cask. So where does the barley fit in? HELP – Step in our mate Vic Cameron who worked in the industry for almost 25 years, with a decent amount of experience regarding sourcing/malting barley and its use. Sitting on industry committees such as the IBD Barley Committee and the MAGB Technical Committee also provided him with wide experience. Thank goodness, this is starting to worry my wee brain far too much, by the way, pass me my Weetabix and barley water please. 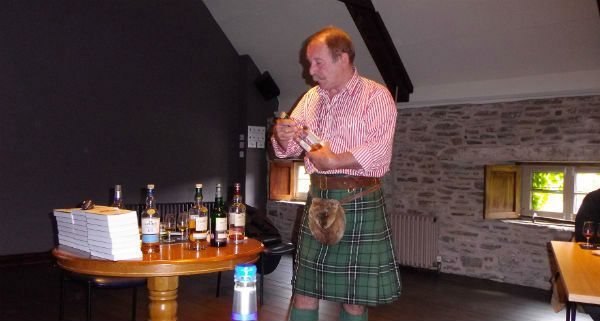 Vic has taken whisky schools, tastings and general whisky informative chats for us here at MCLEANSCOTLAND. Liz and I usually sit in, mouths open as Vic comes out with stuff we have never even heard of, he answers questions we have not even thought of, as Liz said “he makes barley come alive”. In Vic’s opinion, barley variety has very little or no effect on new make spirit character, today the industry are working with Concerto, Odyssey, Propino and a few others. Paul loves ‘Stairway to Heaven’ – the nickname for the malting barley testing process, he is a big Zep fan. For Vic, he believes the barley adds flavour, but not hugely significant compared to the wood, and thinks that the different varieties add the same general flavours. “I am a ‘Talisker man’ and want my Talisker 10-year-old to be the same year in, year out. I am sure the rest of you malt whisky drinkers out there feel the same about your favourite tipple”. By the way, Vic has worked there. No barley variety stays around for more than three or four years, due to disease resistance breakdown and other factors, varieties are constantly changing. To get a couple of hours with Vic and open your mind to barley, where it comes from to the end produce and all in between, you need come on one of our educational whisky tours, inside distilleries, tastings, and Vic! For more info contact Liz@mcleanscotland.co.uk or visit www.whiskytours.scot Thanks to Vic and Michael for their help.